What's in the Bay Model? 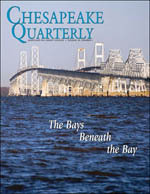 Cover photo: Looking north along Maryland's Kent Island toward the Bay Bridge, you can see a diversity of land uses. 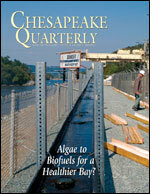 Excess nutrients and sediment washing off the Chesapeake Bay's watershed are causing harm to the estuary's ecosystem. Scientists are using computer simulations to quantify these causes and effects to help leaders find the right solutions. Photograph, David Harp. 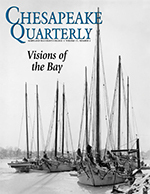 Cover photo: This image of skipjacks in winter rafted together in Annapolis Harbor became a famous and popular poster for Marion E. Warren. 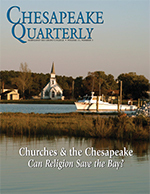 Churches & the Chesapeake: Can Religion Save the Bay? Whatever Happened to Watershed 263? What's Happening to the Gulf Stream? Adaptive Strategy or Fiscal Sand Trap? 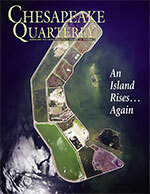 Can an Engineered Island Help the Bay? 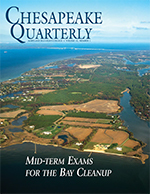 Cover photo: A 2012 aerial shot of the reconstructed Poplar Island in the Chesapeake Bay shows the island's perimeter, which consists of boulders piled 10 feet high. A network of dikes separates marsh sections or "cells." Two natural islands, Jefferson and Coaches, lie to the right of Poplar. Photograph, U.S. Army Corps of Engineers. Cover photo: Spotted salamanders (Ambystoma maculatum), including this one lying on a log near Ithaca, New York, are common across the eastern United States, including in the Chesapeake Bay watershed. Photograph, John Cancalosi. 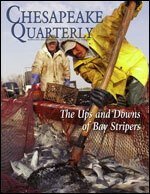 Cover photo: Billy Callaway (at the tiller, standing behind one of his workers) is the third generation of his family to fish for striped bass out of pound nets in the Chesapeake and its tributaries. Photograph, David Harp. Cover photo: An underwater fisheye-lens shot gives a dramatic view of bay grasses and a fisherman in the Susquehanna Flats. In recent years underwater grassbeds have suddenly expanded across the Flats, the broad, shoal-like shallows at the head of the Chesapeake Bay. Grass species returning to the Flats include redhead grass, coontail, watermilfoil, water stargrass, and wild celery. Photograph, Octavio Aburto. 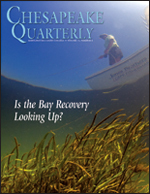 A Model Plan: How Can We Gauge the Bay's Cleanup? 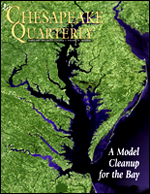 Cover photo: Full of twists and turns that stand out in this satellite image, the Chesapeake Bay and its watershed make up a grand and complex ecosystem. Scientists in the region are working to represent that entire environment using computer simulations, efforts that are guiding a new push to clean up the Bay. Photograph, NASA Scientific Visualization Studio. 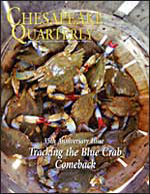 Cover photo:Blue crabs big enough for the "basket trade." These crabs can be sold for steaming and eating at summertime crab feasts. You can tell these are female crabs: they "paint their nails red." Photograph by Michael W. Fincham. 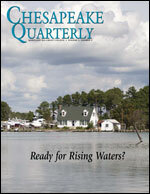 Cover photo:Did Algonquin tribes call the Chesapeake a "great shellfish bay?" 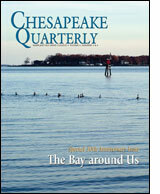 Scholars disagree on the origins of the Bay's name, but scientists agree that the waters of the Chesapeake were once the greatest oyster grounds in the world. 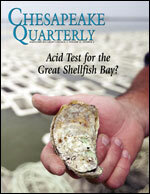 A new generation of oyster farmers could face a new challenge if acid levels rise in the estuary. Photograph by Michael W. Fincham. 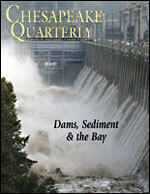 Cover photo:The Conowingo Dam opened its gates to alleviate flooding on September 9, 2011, as Tropical Storm Lee swept through the area. Photograph by Patrick Semansky, Associated Press. 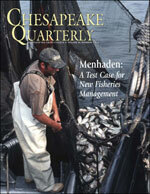 Cover photo: More pounds of menhaden are landed each year than any other fish in the Chesapeake. 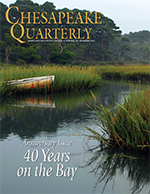 The fish is valuable not only commercially but for the ecosystem — it provides food that sustains striped bass and ospreys and many other predatory fish and birds. With menhaden stocks at their lowest point in half a century, is it time to try a different kind of management? Cover photo:The Chesapeake Bay Bridge, seen from the eastern side, was designed with a high suspension span in the center to allow large ships to pass through on their way to and from Baltimore. The deepest waters under the bridge are not found under the high center span, but under the smaller span near the Eastern Shore. Buried beneath the eastern side of the Bay is the 18,000-year-old paleochannel of the Susquehanna River. Photograph, Michael W. Fincham. 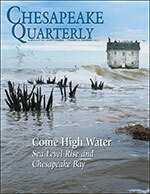 Cover photo:In the low-lying area of Maryland's Eastern Shore, houses on Hooper's Island, are especially vulnerable to rising sea levels. After heavy rains and higher than average tides, water can pool in front yards and make impassable the one road that bisects this narrow sliver of land. Photograph, Erica Goldman. Cover photo:Thick and murky, the headwaters of the Corsica River drain nutrient-laden water dowstream to the mainstem Bay. Suspended sediment clouds the water along with single-celled algae thriving on a feast of excess nitrogen. Photograph, Erica Goldman. 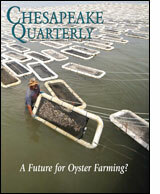 Cover photo:Bubba Parker works his way down a line of oyster floats at the Choptank Oyster Farm. Turning the floats helps burn off the algal biofouling that builds up on the underside. Photograph, Michael W. Fincham. 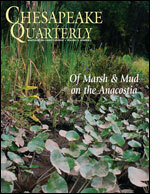 Cover photo:Marsh and mudflat intermingle at Kingman Marsh on the Anacostia River. Heart-shaped spadderdock (foreground) thrives, one of the few species not palatable to hungry resident geese. Photograph, Erica Goldman. 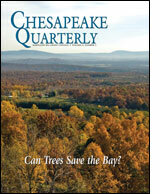 Cover photo:Trees stretch toward western Maryland on a bright October morning. 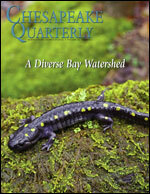 It's in the Bay watershed's western reaches that most big stands of forest remain. edge was impressive. Though early forest. Photograph, Jack Greer. 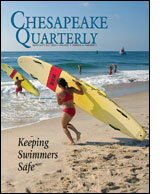 Cover photo:Rescue boards in hand, rookie lifeguards hit the beach at Ocean City, Maryland. Their final training exercise includes using these surfer-style boards, often the fastest way to reach a swimmer caught in a rip current. Photograph, Michael W. Fincham. Cover photo:Dark sentinel on the Baltimore waterfront, the MV Cape Washingtonkeeps watch after its return from the war in Iraq. While it waits in ready reserve, the ship serves as a maritime test facility, helping to defend against invasive species transported in ballast water. Photograph, Jessica Smits. Cover photo:Like a conveyor belt for nutrient removal, this Algal Turf Scrubber uses mats of algae to take up nitrogen and phosphorus. Could devices like this help clean Susquehanna River water before it reaches the Chesapeake Bay? Photograph, Erica Goldman. 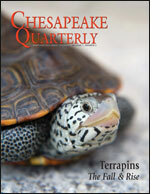 Cover photo:The diamondback terrapin is known as the mascot of the University of Maryland College Park and the official state reptile. This particular diamondback is known as Patsy, and she was rescued by Marguerite Whilden of the TerrapinInstitute and Research Consortium. Photograph, John Consoli. 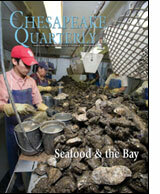 Cover photo:Light bathes an oyster bar, with a little help from professional photographers. Veteran underwater cinematographer Nick Caloyianis (pictured here, with light), carefully set up this shot of a restored oyster reef, built on rubble from the Wilson Bridge. 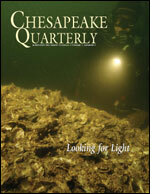 Behind him lies the unlit gloom of the Chesapeake, which grows murkier every year. 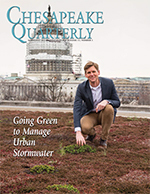 Photograph, Michael Eversmier, Aqua Ventures, Inc.
Cover photo:Green returns to Fulton Street. For a long time local residents fought to bring back a median originally designed in the early 1900s by Frederick Law Olmsted, Jr., son of the famed landscape architect who created New York's Central Park. The historic median disappeared in 1951 with the widening of Route 1, a north-south trucking route. With truck traffic drawn to bigger highways and after 12 years of community pressure, the city restored a 1.5-mile-long tree-lined median to this West Baltimore neighborhood. Photograph, Skip Brown. 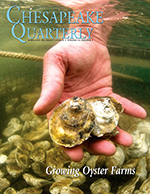 Cover photo:Oysters come streaming into Harris Seafood from the Chesapeake but also from the Carolinas, the Gulf, and New England. Local processors depend on product from waters far away and workers from other countries - especially guest workers from Mexico - to keep afloat. Photograph, Skip Brown. Cover photo: Autumn sunset at the mouth of the West River. Photograph, Sandy Rodgers. 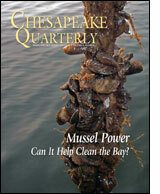 Mussel Power — Can It Help Clean The Bay? Cover photo: Clinging to any free surface they could find, dark false mussels encrusted ropes like this one in the summer of 2004, when a bivalve explosion took the Magothy, South, and Severn rivers by storm. Photograph, Peter Bergstrom. Cover photo: A hint of irony graces this trailered boat in an Eastern Shore fishing community. 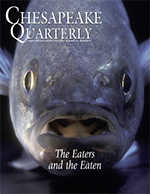 The Pfiesteria crisis of 1997 put watermen ouf of work and led to river closures, public panic, and a loss of $40 million in seafood sales in Maryland. Photograph, Michael W. Fincham. Cover photo: Dredging crabs is winter work for mate Eddie Weber, aboard the Mydra Ann, as watermen help scientists survey blue crabs in the Chesapeake. Photograph, Skip Brown. Cover photo: As water temperatures rise and precipitation patterns change in a warming atmosphere,marshes like this one in the Chesapeake Bay will feel the effects. Photograph, Skip Brown. 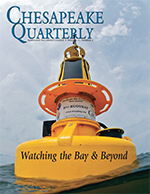 Gene Burreson and Nancy Stokes read an X-ray film showing the sequence of a key section of the DNA of MSX, the parasite that devastated oyster populations in both Delaware and Chesapeake bays. Though X-ray films have now given way to computer screens, the earlier technique provided a key to finally figuring out the probable origins of the MSX parasite. Photograph, Michael W. Fincham. Denizens of a world beyond human perception, bacteria in aquatic environments can perform complex ecological feats. (Top right) Sacchariphagus degradans 2-40, Photograph, Ronald Weiner; (middle) Silicibacter TM1040, Photograph © Dennis Kunkel Microscopy, Inc; (bottom) Dehalococcoides ethenogenes, Photograph, Stephen Zinder. 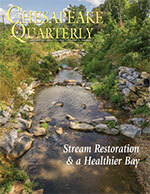 Cover photo: Corralling the rain, a new storm drain sends fine silt towards Beards Creek. 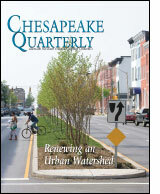 Construction recasts the region's natural hydrology. Photograph, Jack Greer. 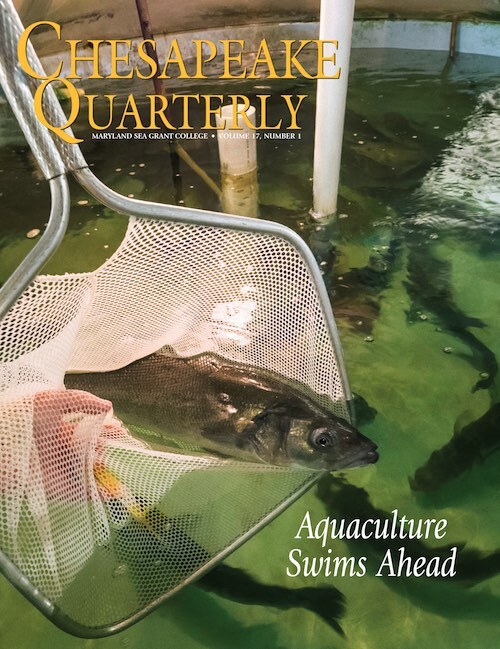 Cover photo: Like glittering gems, oyster larvae recall a time when watermen dubbed abundant Chesapeake Bay oysters "white gold." Invisible to the naked eye, these larvae of the native oyster, Crassostrea virginica, use tiny hairlike cilia to swim in search of a place to settle. 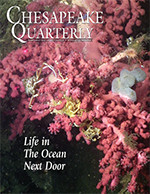 Photograph, Maryland Sea Grant Extension. Ship Shape for the Future? Cover photo: Pride of the Wallenius-Wilhelmsen Line of Norway, the 66,000-ton giant Taiko heads up the Chesapeake in early May. Photograph by Michael W. Fincham. 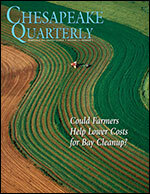 Cover photo: Like many other Eastern Shore farmlands, this one lies next to a tributary of the Chesapeake Bay and has a buffer of grasses to slow runoff of sediment and nutrients. Photograph, Skip Brown. 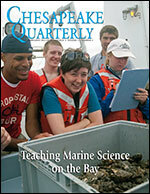 Cover photo: Adam Frederick carries living cargo into the classrooms of Maryland high schools. Photograph, Michael W. Fincham. On the Road to Restoration? A new Bay for the Oyster? 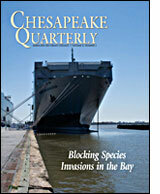 A Chinese Oyster for the Chesapeake? 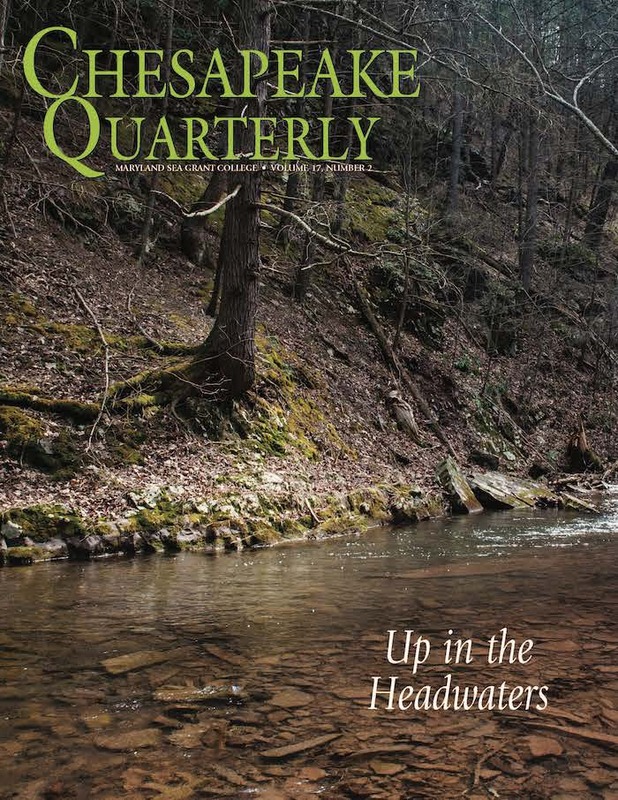 Cover photo: Wetlands are major buffers filtering out large quantities of sediment, pollutants and nutrients before they reach streams, rivers and bays. Photograph, Skip Brown. Cover photo: A summer day from 500 feet, looking north across Kent Island toward the Bay Bridge. Photograph, Jack Greer. 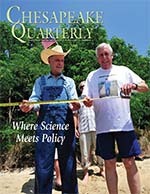 Cover photo: Bill Boicourt, in front of the R.V. Cape Henlopen, before a research cruise. Photograph, Michael W. Fincham. Cover photo: Bycatch - like this basket of croakers on a crabbing boat - provides one example of how each fishery involves more than a single species. Photograph, Skip Brown. Cover photo: Getting ready for the start of crabbing season, watermen Roy Ford and son Ryan stand in the doorway of the shanty where they shed soft crabs. Photograph, Skip Brown. 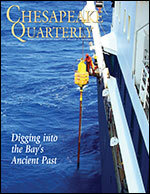 The Rise and Fall of the "Two-Sail Bateau"
A New Oyster for the Bay? 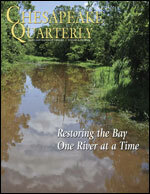 Does the Bay Need a New Oyster? What's Killing the Native Oyster?